CLICK HERE TO CONTACT USVery often we find that first time customers prefer to buy their air bearing system in kit form with everything included. This has proved so popular an option that we now quote four and six station kits as standard product items. Air bearing kits are available in either square aluminum or round steel format. Whichever kit you choose, it will be supplied complete with modules and pre-installed air bearings, valves, air supply hose, tee-pieces, ball valves, and virtually everything else that is needed for your system to work right out of the box. First time setup is a breeze and you'll be moving loads in no time at all. 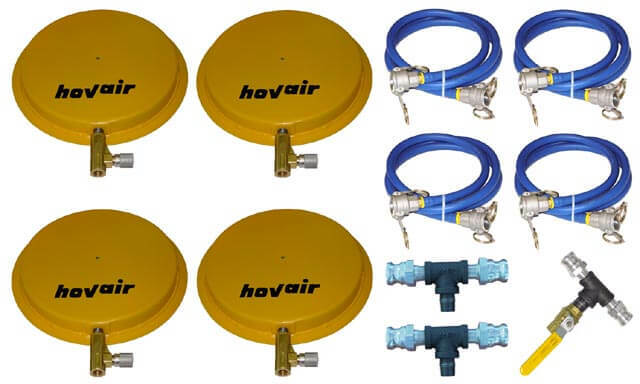 All air bearing kits come complete with easy to understand operator manual, plus you will always have Hovair's free telephone and email support. No, not at all. You will need a minimum of three load modules to produce a balanced and even footprint, and if that is enough to move your load smoothly, then you can put the others away for a while.Having, say, a six station air bearing kit, however, does offer greater flexibility when moving loads of uneven weight distribution, or irregular shape. Perhaps you have a load that is 10 tons at one end and only 3 tons at the other. Naturally the ten ton end is going to need more support than the three ton end. So, what to do? Put four modules around the heavy end and two around the light end. Adjust the modules appropriately and move the load smoothly and safely. Now THAT is flexibility!Shown above right is a typical round steel air bearing kit as supplied with all tee-piece and valve hardware, air supply hoses - without a remote control system.